Yerba mate is a tree that grows in the Paraná, Uruguay and Paraguay river basins; the region where Argentina's, Brazil's, and Paraguay's three borders meet. The indigenous people of that area, the Guarani, used this plant for its nutrition and healing effects. Yerba mate's use today is different from the old Guarani method of consuming it. They would marinate the leaves for days and then drink the liquid as medicine to cure a variety of diseases (rheumatic, intestinal, etc.) and as a comforting elixir that would provide them with strength and energy. Mate is drank in a variety of ways, according to the traditions and tastes of different areas of the country, by adding to the drink either brown sugar, orange peels or herbs that vary from region to region. For example: chamomile, coffee, mint, etc. It's all about an infusion that finds part of its charm in the small ritual which surrounds it. For those who do not know, the word mate originated from the Quechua term mathi, which means a cup or container from which to drink and made out of a gourd. And that is the mate. 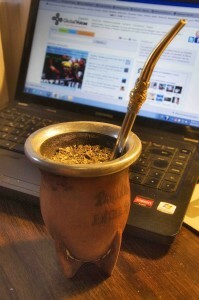 Yerba mate and a bombilla, which is a type of straw with a filter on the lower end, are placed into it. The act of refilling it with hot water (never boiling) is called steeping. The prices before the increase were fixed at $0.90 per kilo of green yerba and $3.30 for the canchada placed out to dry. Thus the increase is around 88%. But if one takes into account the production cycle of yerba mate, the final product increases would begin starting June of 2012. However, storekeepers applied the increase on April 1 for the final product already on the shelves. Be right back, I'm going to put a bit of already used #yerba up on the roof to use again when it dries. Your statements not only offend them in particular, but also all of us who are proud of our heritage. My grandfather was one of those immigrants that came to this great country. He, like many others, was a humble man, but he was educated and had values. He volunteered in World War II to fight for his beloved homeland that was invaded by the Nazis. I do not know if you listen to music, but I recommend you listen to a Mr. Chopin. He is considered one of the greatest composers in history. He was polish, but not a dumb***. The Chamber of Deputies released a statement, rejecting [es] Moreno's words. While users on Facebook the group “Solidarity with the polish yerba farmers” [es] also showed their outrage.